Many years ago, before kids, a Murder Mystery Party was the traditional event held each October to celebrate my birthday with four couples in attendance. Roll the clock on 10+ years and we decided to reinstate the tradition for Foodie Loon's Birthday. Unfortunately one of our original couples have since moved away so were were reduced in quantity but not quality to six. Roll up, Roll up for Death in the Ring at Slippery Sid's Circus. Both my starter and desert came from an Amouse Bouche book that I was given at Christmas. 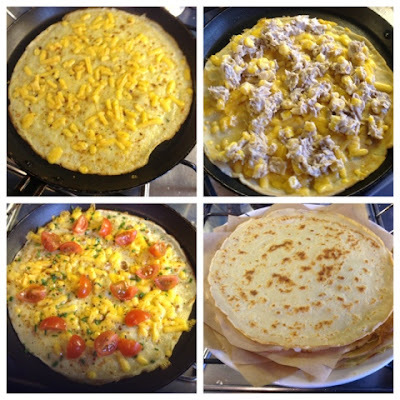 I had bookmarked a couple of recipes that I wanted to try and this was a great chance to give them a go. 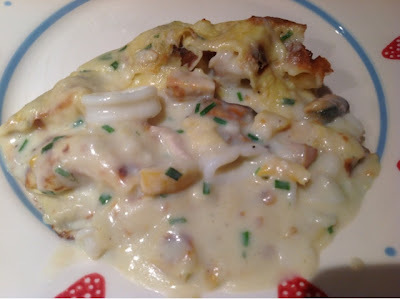 Potage de Courage avec Biscuits au Saumon et Fromage. Butternut Squash soup served with Cheese and Salmon Biscuits. The biscuits were really good and the small portion of soup in a cup worked well as not too filling. The main course was actually leftovers from Christmas. Fear not it had been in the freezer. A whole leg of lamb that my Dad had received from a fellow farmer had been bumped from the Festive Meal plan. The Persian Spiced Pulled Lamb recipe had been recommended to me by a couple of twitter friends and it didn't disappoint although I had my reservations about how it looked at the marinading stage. The smell as it cooked for five hours was amazing. I served it with Garlic and Parsley Flatbreads, Humous, Cous Cous with Roasted Vegetables and Ratia. Absolutely loved it as did my fellow circus performers. Plenty of leftovers for the next day too. Desert was Tarte a la Rhubarbe served with Rhubarb, Ginger and Vanilla ice cream. The first proper outing of my new Ice Cream maker after my disaster at Christmas when the old one failed to freeze. I do love Rhubarb in a desert and this was a perfect combination. Following desert it was time for coffee, liqueurs and accusations. I'm blaming the fact that I spend some of the night in the kitchen and missed out on vital evidence for the fact that I had absolutely no idea who dun it. Turns out that Raisa Legova the Russian Trapeze Artist and Tractor Driver was the guilty party. 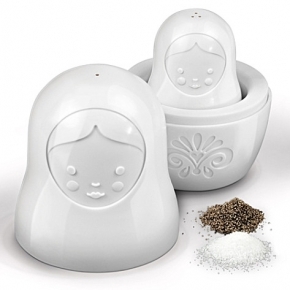 I forgave her for committing the heinous crime in my big top as she brought me a gorgeous Russian Doll salt and pepper set. A fantastic night full of fun, friendship and good food. Definitely won't leave it ten years until the next murder. Crikey. Its March at the end of the week. 2013 needs to slow down. Last week whizzed past and thankfully internet access has once again been fully restored to the Foodie Quine household. However did we cope in the olden days?! Managed to almost stick to the meal plan this week. Used up some leftovers and bits languishing at the bottom of the freezer and tried out some new dishes too. The coriander paste was great addition to oven baked fish and Simon Hopkinsons pasta dish was divine. Infusing the hot milk with the dried mushrooms made a huge impact on the flavour of the sauce. Such a good hearty dish. I've blogged the full story of the Spelt and Sausage Casserole here. An edible Duffle Coat of Spelt from Nigel. 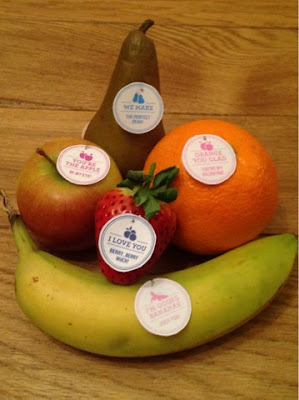 A failure for Supermarkets but success with shopping local. The Butternut Squash Ravioli never got made as I had no 00 flour so it's bumped to this week in its place we had burgers and chips. But neigh horse burgers here. Chilli Gordonian Steak Burgers from Andrew Gordon Butchery. Awesome. This is a recipe I've had and loved for years. I'm pretty sure that it came from the original Food & Drink TV Programme back in the 80's. Its somewhat like a quiche but uses potato rather than pastry for the base. Bumped from last week I've ensured that 00 flour is on this weeks shopping list so this will finally be made. 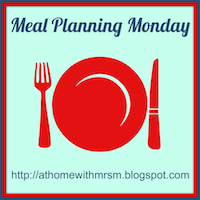 At Home with Mrs M is the place to go to check out all this weeks #mealplanningmonday shenanigans. 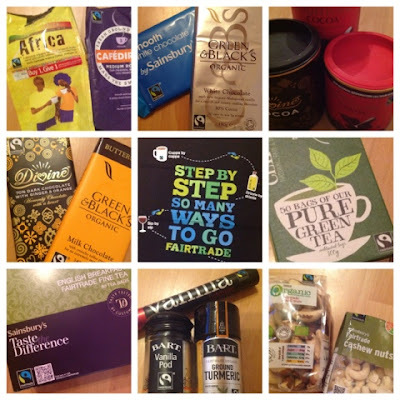 This week also heralds the start of Fair Trade Fortnight. I've got lots of Fair Trade goodies in my storecupboard to make use of and have a few ideas up my sleeve of how to #gofurther for Fair Trade. I'm also going to be helping organise a Fair Trade Bake Off at boy and girl's school. At least any soggy bottoms will have been traded fairly. I couldn't not make it after that endorsement. It featured on my Meal Planning Monday post for the last two weeks but kept being bumped because of lack of Pearl Spelt. The recipe came from the Sainsbury's Magazine so I assumed that they would stock it. I was wrong. I asked at customer services in my local store but no. They even checked nationwide but apparently it isn't actually stocked at all by Sainsbury's. The assistant helpfully suggested that I may wish to use spelt flour as an alternative. As if that would have worked. She really couldn't understand why I was unimpressed that they didn't stock a product mentioned in their magazine. So I took to Twitter and asked Sainsbury's why they didn't actually stock one of the key ingredients required for a recipe in their magazine. No reply. I emailed them. No reply. Kind of says it all really. @realnigelslater @foodiequine The Magazine is actually independently owned. They often feature things not in store. And get it they did. From Sharpham Park an organic estate in Glastonbury. When I popped in past Hammerton to see if my spelt had arrived it literally just had and the cardboard boxes were being unpacked so I also bought some other goodies. Spelt Risotto with Wild Mushrooms and Spelt Crunchy Fruit and Fibre Cereal. I kept pretty much to Mr Slaters recipie but added some English Mustard powder to the spelt cobbles and some mushrooms to the casserole. My favourite part was where he instructed you to cut the sausages into cork lengths. That is a unit of measurement with which I am very familiar. The resulting dish was really tasty and so filling. The spelt had a fantastic texture and nutty flavour. I shall definately be using it to cobble more dishes. @realnigelslater @foodiequine Local shopping every time! So its been and gone and all over for another year but I still wanted to share what we did. 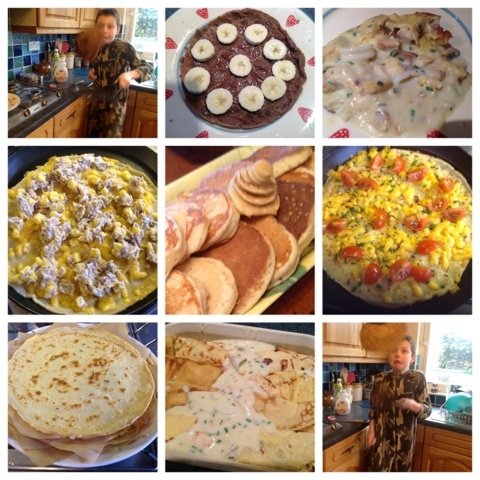 Shrove Tuesday coincided with half term which meant that the kids were around all day so we indulged morning, noon and night. 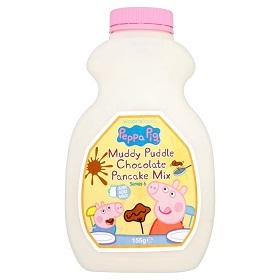 First up at breakfast were the Peppa Pig Muddy Puddle Pancakes from a packet mix which I will fully admit I was anticipating being awful. However they were rather successful and tasted pretty darn good with lashings of Nutella and banana. 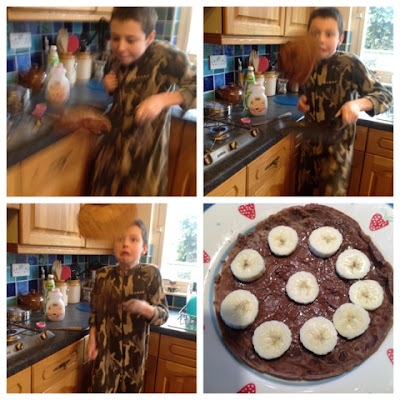 Boy still in his onesie gave flipping a go. Love his facial expressions. Girl was happy just to eat. The more chocolatey the better. Savoury crepes for lunch with everyone getting their own choice of topping. I use Delia's recipe. Boy opted for cheese, paprika and chilli and girl tuna sweetcorn and cheese. I went for cheese, chive, tomato, paprika and chilli followed up with a traditional sugar and lemon. At the same time I cooked off eight more to use for dinner in the evening and stacked them up interleaved with greaseproof. 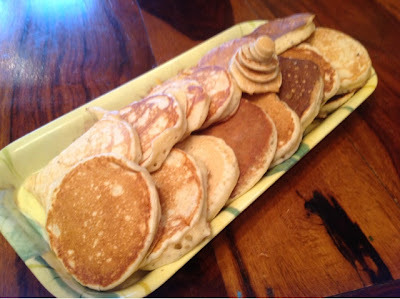 Friends came round in the afternoon and boy cooked up a batch of bannocks/scotch pancakes. He did a great job all on his own especially once he got the temperature of the griddle under control. The Great British Bake Off trick of hiding the burnt ones underneath was adopted for serving. Boy requested Seafood Pancakes for dinner but by this time girl had had more than enough and could not believe that we were having them again. Perhaps you can get too much of a good thing. 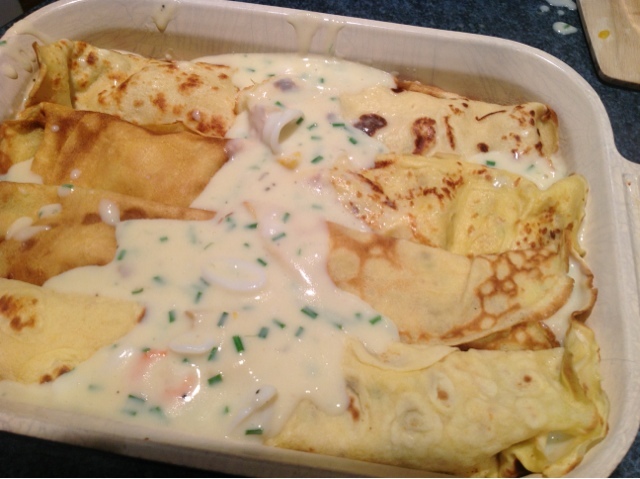 The premade crepes were filled with mixed fish and seafood in a white sauce and warmed through in the oven. Twitter was full of pancake day references throughout the day and I tweeted some of my efforts @foodiequine including the montage below. Richard Stone aka @MrCookShop offered up a prize and guess what - we won! 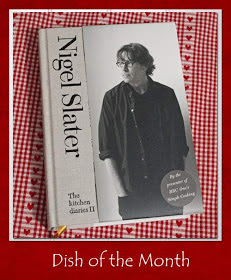 You can read all about it on the Mr Cook Shop Blog. This is where it gets tricky. The choice of prize was a Gingerbread Man Baking Set or a Victoria Eggs Apron. I do love the Victoria Eggs range and planning ahead bought a Christmas themed apron from it in the January sales. So without discussing with boy and girl I chose an apron. Big mistake. I then confessed that we had won a prize and of course they asked what and I immediately felt guilty so showed them the options and of course they overruled me with gingerbread. Our prize arrived at the weekend and it is gorgeous. 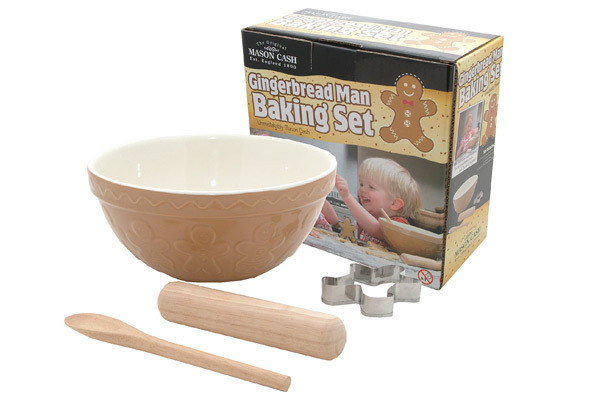 I absolutely adore the gingerbread bowl and have no further longings for yet another apron. It's not very clear in the picture but it's a traditional Mason & Cash bowl but with boy and girl gingerbreads round the side. Thanks again to Mr Cookshop for the prize but I'm definitely giving up pancakes for Lent. Its cake club time again. Pinnies & Petticoats. Managed to get myself double booked for this one as was already signed up for a quick cook session at Nick Nairn Cookschool from 6pm - 8pm so I knew I was going to have to roll up fashionably late after cooking and consuming a "Perfect Sole Supper". The theme for this month was of course Valentines. 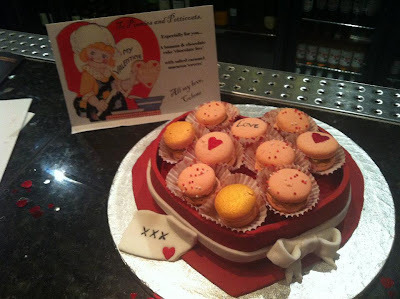 Our very own cake club bun in the oven was due to ping on Valentines day but popped out early. Congratulations Emma and welcome to the world baby Lucy. I opted for a savoury bake as thought there would be lots of sweet treats on offer. I had pinned the Cherry Tomato Hearts months back and wanted to incorporate them so decided on cheesy heart biscuits to accompany. 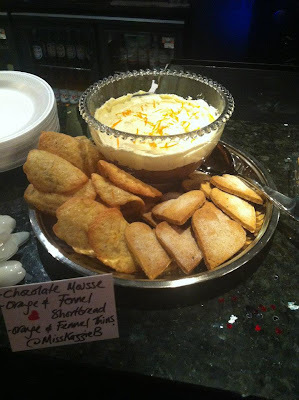 After a rummage through cookbooks and blogs I opted for Cheese Oatcake Crackers from The Pink Whisk. I followed Ruths recipe pretty much as is but added some English mustard powder to the mix, used Lockerbie Cheddar as my Cheese and sprinkled paprika on top of some of my hearts. Because I was late I missed the window of photo opportunity before everything was tucked into so thanks to Miss Petticoat aka Colene for some of the the photos. We had less bakers this time but its quality not quantity that counts. Not sure if the weather put folk off or if people were getting romantic at home a day early. 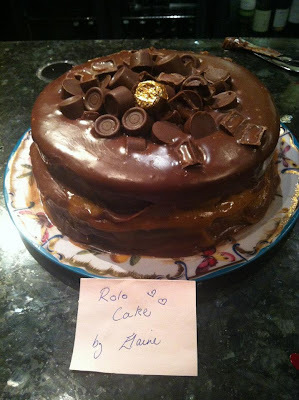 The theme was showstoppers and there were three bakes that took top marks in that respect. I don't do big cakes so am in total awe of them all. Although I reckon I could give Elizabeth's Lime Buttercream a try. Banana & Chocolate "Cake Box" with Salted Caramel Macaron "Sweets"
My favourite bake of the night would have to be the only other savoury. @MissKazzieB's Gougeres. 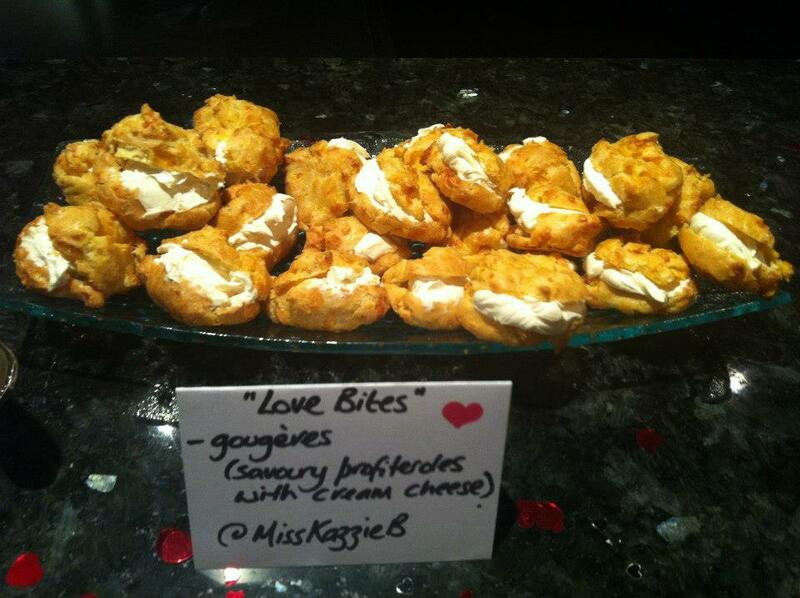 Savoury profiteroles filled with cream cheese. A much better love bite than a Hickie from Kenickie. 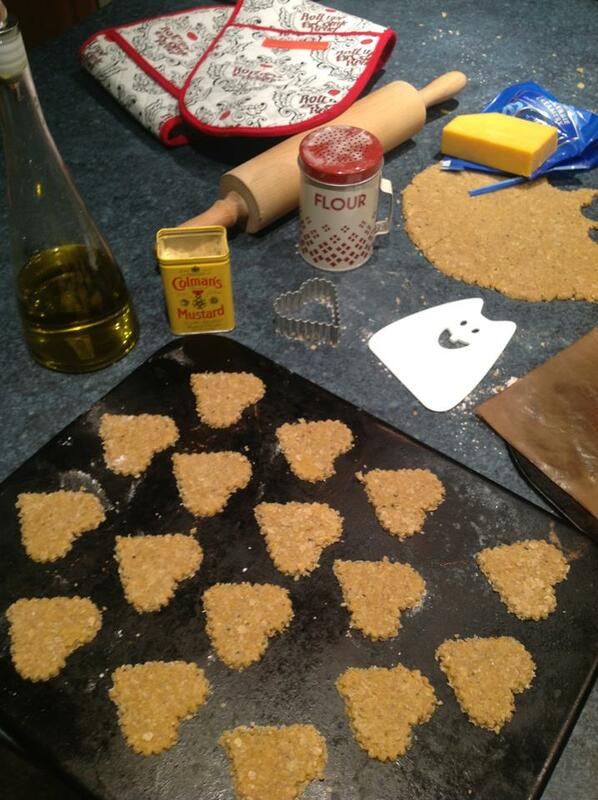 Biscuits next with heart shaped stripey shortbread perfection from Lou at Please Do Not Feed the Animals. We also welcomed another local blogger Victoria from Victoria Sponge Pease Pudding who in addition to bringing along her Cranberry, Orange and Poppy Seed Cookies is going to be writing a piece about Pinnies and Petticoats for STV Online. 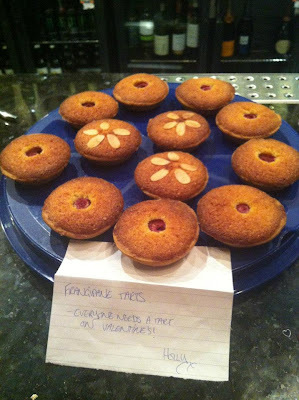 I'm more confident at baking little cakes and loved the selection on offer especially the Frangipane Tarts as like Holly says - everyone needs at Tart on Valentines! I loved the sentiment behind Pauline's bake. She cooked the chocolate cheesecake muffins as they are her husbands favourite. Awwww! 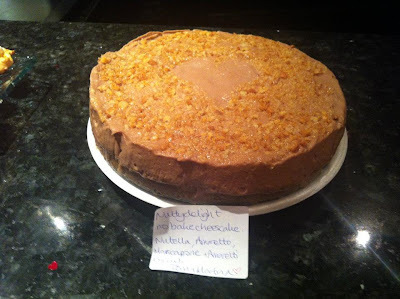 Th fact that they are currently without a kitchen didn't come in the way of Tom and Martin who rustled up a boozy no bake cheesecake in their living room. Containing Amaretto, Nutella, Marscapone and Amaretti it couldn't fail to impress. I'm afraid I never got to try the Chocolate Mouse with Orange and Fennel Shortbread and Thins. 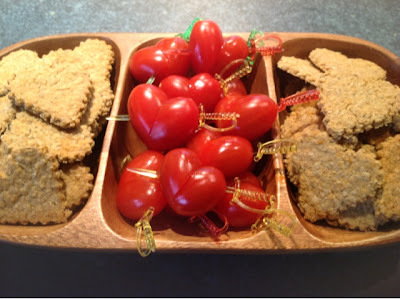 I did sneak a shortbread heart into my tupperware but the mousse was more tricky to transport. So that's us for another month. 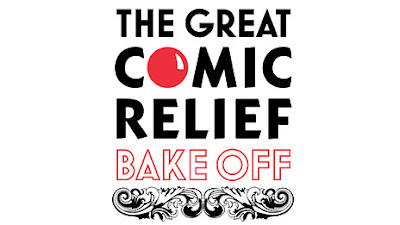 Pinnies and Petticoats is back in March supporting Comic Relief with a Red Nose Bake off. All the details are on our event page. Bake cake. Come along. Eat cake. Strive to create a just world free from poverty. Last but not least I'll share what I gave my beloved for Valentines Day. He asked for a "fruity surprise" so that's exactly what he got. But how did my week with Gok go? Due to the change in plans we celebrated Chinese New Year a day early on Saturday night. The "show-stopping twice-cooked melting pork" didn't get eaten on the Friday night as planned as I didn't realise it took so long to cook. Fish and Chips all round as a substitute. It was really tasty but not quite up to Gok's hype. His fried rice was however amazingly good with the secret ingreedient being anchovies. The pork and ginger noodles were nothing special but the loin of pork did stir fry very well so would use that again. The soy glazed chicken didn't turn out quite as well as when I have made it previously. Not quite sure why but I will persist with it. The cucumber, spring onion and chilli salad was however amazingly good. Stir fried prawns with cashew nuts were a big hit too. And so to this week. Or what's left of it. Wednesday - Perfect Sole Supper Whole fish, crisp skin, buttery, lemon, parsley sauce and ultimate crushed potatoes. Bit of a double booking tonight as I'm doing a quick cook class at Nick Nairn Cookschool between 6pm and 8pm and its the Pinnies and Petticoats Valentine Showstopper from 7.30pm Foodie overload. Spotted this recipe in the Frugal Suppers feature by Nigel Slater in the current Sainsbury's Magazine. Hope I can track down pearled spelt. We are having friends over for a Murder Mystery Party to celebrate Foodie Loon's Birthday. Murder at Slippery Sid's Circus. Think I'll do a starter from the Amuse Bouche book I got at Christmas but no idea what desert will be and I've still got to make my costume. Sunday - This is Foodie Loon's actual Birthday so we'll go out for a meal. Not sure where. So that's last week and this. A day late and not desperately well planned. Hope Mrs M will still let me sneak in to her round up.